Cheap oil is needed for economic growth, and we are simply running out of the good, cheap crude. Energy and economic prosperity go hand in hand. In his post EROI, Insidious Feedbacks, and the End of Economic Growth David Murphy argues that “Cheap oil is needed for economic growth, and we are simply running out of the good, cheap crude.” He goes on to demonstrate falling return on investment from oil extraction and other energy sources. What does this mean for our future economic prospects? There is little doubt that the fossil fuel era will eventually end (and much sooner than we think), and as it does energy may become much more expensive. There is also little doubt that we are very wasteful of current energy supplies. We are borrowing our prosperity from our children. We need to act now to significantly reduce our energy consumption and find alternative energy supplies in order to maintain our current standard of living. 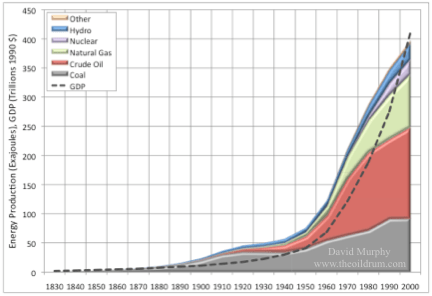 Our concern over the environmental damage of fossil fuels may become secondary to the economic impact of dwindling oil.